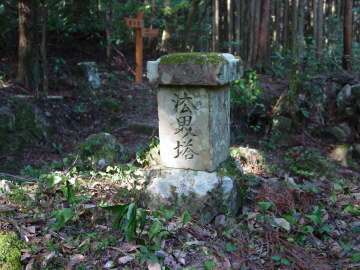 "Mizutsubo-jizo" is said to be built in 1850. 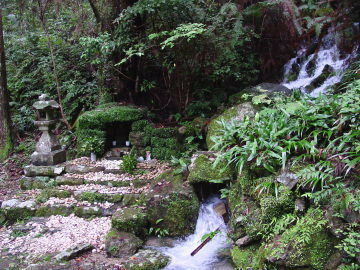 There are two jizo on Yokogaki-toge Pass trail, and both is built in 1800's (Edo Period). 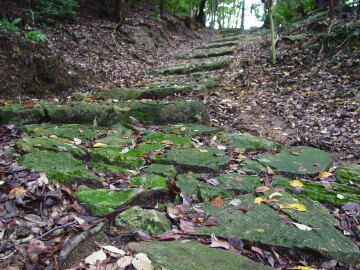 On Yokogaki-toge Pass, from Saka-no-toge Pass to Sakamoto village, you can enjoy good stone path. 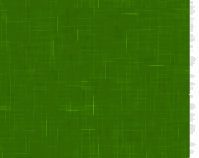 Stone path is very slippery, especially on rainy condition. Be careful ! 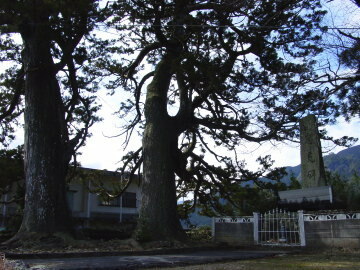 From Takachira Bus Stop to the starting point of Fuden-toge Pass, you will find two big Japanese cedar trees. Formaly there was a much more big cedar tree here, but it was fired out in 1885. Here was a part of "Oroshi castle." On Fuden-toge Pass, there is "Hokai-to tower." "Hokai" means all of universe. "Fuden" means "wind and convey," this name is from strong wind blowing around here.